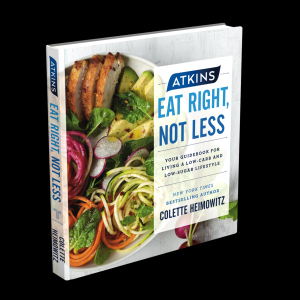 If you are interesting in learning how to follow a carb controlled way of eating, Atkins: Eat Right, Not Less by Colette Heimowitz is a great book to help you master the basics of what's involved. This is not a diet book, but rather a source of information that will help you learn how to benefit from reducing your carb consumption while continuing to enjoy a wide variety of delicious foods. The first part of this book focuses on helping readers understand the negative implications of eating too much sugar, followed by details on what the Atkins low carb approach to eating is like. Whether you're looking to lose a lot of weight or just a few pounds - or even if you're looking to maintain a healthy weight by following a nutritionally sound way of eating, this book is a great resource. Atkins: Eat Right, Not Less is not about eliminating carbs from your diet. It's about reducing consumption of excessive carbs and sugar, which is something that anyone who is concerned about health promotion can benefit from doing. The author provides several different approaches to incorporate carb-controlled eating into your lifestyle, including an option for very low carb eating (20 grams of carbs per day), as well as a middle-ground approach (40 grams of carbs per day) and a more moderate approach (100 grams of carbs per day). The book provides helpful tips and suggestions for making wise choices that will lead to reduced consumption of carbohydrates, as well as strategies for managing this approach to eating in a variety of situations where it is easy to over-indulge - such as restaurant meals, holiday gatherings, road trips and more. It also includes example meal plans, guidelines for making smart food choices and practical strategies to help you stock your kitchen with the right kinds of food. The second half of the book features a variety of easy-to-follow recipes for making delicious carb controlled dishes in your home kitchen. 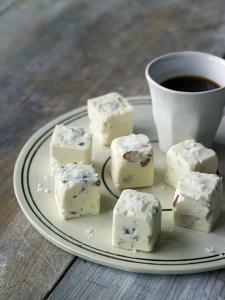 There are options for every meal, as well as snacks (such as baked sriracha hot wings) and sweet treats (like the salted caramel cheesecake bites pictured here). It also includes instructions for putting together a low-carb "Atkins flour mix" that is used for many of the recipes for baked goods (like apple crumble) and breaded items (such as fried green tomatoes) in the book. You can also use the flour mix to cut the carbohydrate content of your own long-time favorite recipes that call for all-purpose flour. Note: If you decide to use the Atkins flour mix in some of your traditional recipes, keep in mind that you may have to experiment a little with the ratio of flour to liquid to get the desired consistency. This is the case with all reduced-carb flours. If you're ready to learn how you can cut carbs without sacrificing variety and flavor, this book is a terrific road map for you to use. It's written in an easy-to-understand manner that makes it easy to figure out how to apply the principles to your daily decisions. I highly recommend it to anyone who is considering going down the path of a carb-controlled approach to eating. Note: The author received a review copy of this book for free. The opinions presented here are her own.